The first issue of The Vaisnava Journal was published to commemorate the 500th anniversary of Lord Caitanya's Appearance Day (1986). Although only five issues were printed and distributed over the next two-and-a-half years, the magazine was popular and well received by many leaders, members and friends of ISKCON. The journal was originally created to help devotees work through their differences in a respectful and co-operative manner. To this end, the Vaisnava Forum (letters section) was launched to help facilitate a healthy dialogue among all participants. The mood was friendly and hopeful, to which the devotees responded in kind. 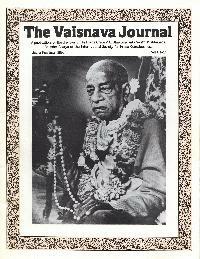 The Vaisnava Journal is therefore the natural predecessor to The Prabhupada Connection. To read a selection from each issue's editorial, click on the front cover photo or volume number of your choice.